Fans are weighing the costs of traveling to Miami, Florida, for the Super Bowl. (CNN) -- Football fans are throwing some Hail Mary passes to try to get to Super Bowl XLIV in Miami, Florida, on February 7. "It's looking kind of skeptical right now," said Ketan Patel, a lifelong Indianapolis Colts fan, who posted an ad on craigslist.org offering to buy tickets to the National Football League's championship game. Patel, a 24-year-old sales engineer with a degree from Purdue University, went to every Colts home game and the playoffs with his brother, a season ticket holder. But the brothers weren't chosen in the lottery for the few Super Bowl tickets the team distributed to the public, and demand is driving prices to around $2,000 on the secondary market. 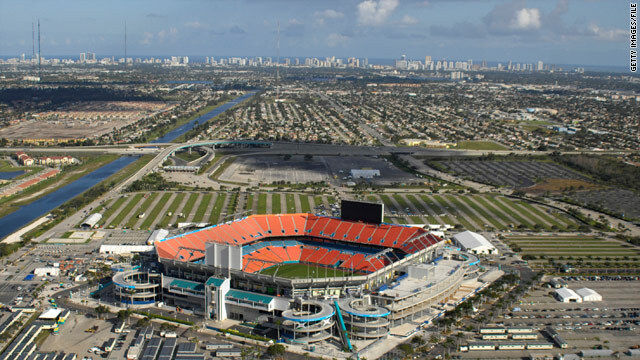 "It's one stadium [in Miami] between two entire stadiums of season ticket holders" from Indianapolis, Indiana, and New Orleans, Louisiana, Patel said. Mark Herring, 39, of Kenner, Louisiana, would like to go, but he's not a rabid fan and doesn't want to pay more than $500 to $800 for a ticket. "But it is an historical moment," the chemical plant planner-scheduler said of the long-suffering Saints' ascension. "And I've never been to a Super Bowl before, so I figured, why not? If I'd ever do one, this would be the time to do it. ... Who doesn't want to see a Super Bowl one time before they die?" Herring plans to drive, but getting to Florida by air shouldn't be much of a problem. Delta Air Lines normally doesn't fly from New Orleans to Miami, but it has scheduled one nonstop, on February 5, for Super Bowl fans, Delta spokeswoman Susan C. Elliott said. Delta doesn't fly directly to Miami from Indianapolis, either, but has added extra nonstops to its hub in Atlanta, Georgia, on February 4 and 5. Passengers can connect to Miami through Atlanta and several other cities, Elliott said. Delta also has scheduled redeye flights back to both cities after the game, and sales are brisk, she said. AirTran Airways, a Colts sponsor, has added extra flights between Indianapolis and Fort Lauderdale, Florida, and even painted the team's horseshoe logo on the tail of one of its planes. The NFL awarded the Super Bowl -- and, for the first time, the Pro Bowl -- to Miami in part because the metro area's hotels could guarantee enough rooms to accommodate the teams, league personnel, sponsors, media and more than 75,000 fans, said Barry Moscowitz, vice president of sales for the Greater Miami Convention and Visitors Bureau. "It's very choreographed," Moscowitz said. "There's a lot of preparation, a lot of planning that goes into the successful execution of these things." Still, finding a room at an affordable rate will be more of a challenge as game day nears, owing to the same market forces that drive ticket prices into the stratosphere. "It all goes to supply and demand," Moscowitz said. "If the demand is high and the supply is low, then the rates will be higher." Patel said he planned to get around that problem by staying with a cousin who attends college in Fort Lauderdale. He and his brother would drive from Indianapolis with two other men to avoid the expense of airfare and car rental as well, he said. "I'd love to go, and you know my Colts are in it, so this would be an ideal situation. But when you're looking at four tickets -- 8 grand just for the tickets -- it's not looking promising," said Patel, who has student loans and a new mortgage. "We'll probably be spending another $500 or $600 just getting down there, and expenses while we're there. That's a good, solid month's paycheck." Andrew Myhre, a disappointed Minnesota Vikings fan in Minneapolis, made a smart move by booking hotel rooms about six weeks ago. But the Saints eliminated the Vikings, so Myhre is offering his room reservations to any New Orleans fan who wants them, no strings -- or surcharges -- attached. 1. Use alternate airports. Flying into Fort Lauderdale may be cheaper than flying into Miami. 2. Take connecting flights. Not as convenient, but often much cheaper. 3. Be flexible with your dates. Returning Tuesday could be much cheaper than returning Monday. "I'm always looking for an opportunity to increase my karma bank account," said Myhre, 48, who owns a chain of chiropractic clinics and is a partner in a sports equipment and sponsorship company. Had the Vikings won, Myhre planned to meet a buddy from Phoenix, Arizona, in Miami. His friend used frequent flier miles to book both their flights on Southwest Airlines and was able to cancel without penalty, Myhre said. Lacking tickets to the game, they had planned to buy a pair from a scalper for up to $2,000 each, he said. If they couldn't get in for that price, they would have watched the game from a bar near the stadium, said Myhre, who as a single man has no family obligations to consider. "I keep a real low overhead," he said. "I can travel like I do and live large. I can afford to be a little more frivolous with my money. But with that having been said, I would have a hard time paying that kind of money. ... You can make a million a year and have a hard time justifying that." They certainly wouldn't be alone in that bar, Moscowitz said. "Many, many, many people come ... without a ticket just to partake in the festive atmosphere -- the events and the parties, just to be a part of all the hoopla and the excitement," Moscowitz said. "I'm not driving 15 hours on a possibility," he said. If they can't score tickets, Patel said, he and his brother and some friends will stay in Indianapolis and watch the game from someone's living room. "It keeps everything cheap if you just buy your own beer and have a grill-out or something," said Patel, who was living in Pittsburgh, Pennsylvania, last year when the Steelers won the Super Bowl. "It's going to be two different spectrums: If we go to the Super Bowl we'll be spending about $3,000 each, or if we stay home it'll be about 50 bucks each."